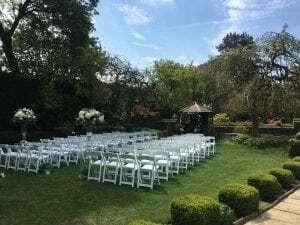 In addition to five indoor rooms, Holdsworth House offers you the unique chance for an outdoor wedding in one of two areas. 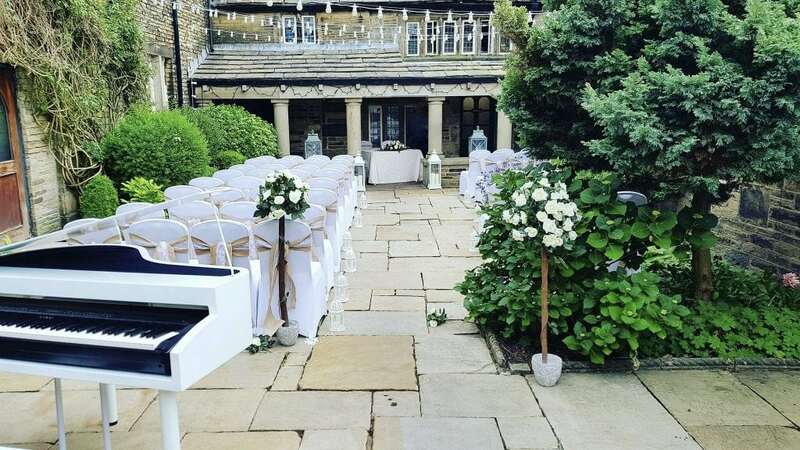 The pretty Colonnade Courtyard showcases beautiful Yorkshire stone flags and a pillared porch. Nestled snugly in the centre of the hotel it features an outdoor fireplace, large candle-filled lanterns and floral borders. In the courtyard the marriage takes place beneath the Colonnade with around 50-60 guests seated in the courtyard; there is plenty of standing space too (allowing up to 80 guests altogether). We can provide the chair covers or you can select your own. You can even have musicians to play. At dusk we light the Courtyard with lanterns and strung lights, making it picture-perfect. 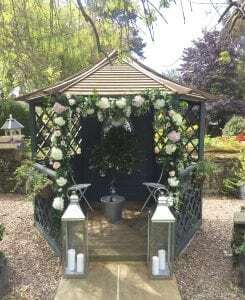 Our Garden Gazebo has been duly licensed by Calderdale Registrars for outdoor marriages on the lawn, from May – September. This means that larger outdoor weddings can be catered for, up to 120 guests*. The Garden Gazebo can be dressed by you, in whatever style you want. Our picture shows the gazebo dressed by Pamella Dunn Weddings. The Garden Gazebo is set between two historic, weeping ash trees, which date from the 18th century. The trees were planted by the Wadsworth Family in 1821 and form a beautful, twisted canopy around the gazebo. In the 1980s, the house owners planted a third weeping ash near the sunken Parterre garden. This third tree was imported from Italy because of its rarity. Our New England-style, folding (and cushioned) garden chairs are set out for you on the lawn, creating an aisle down the centre. 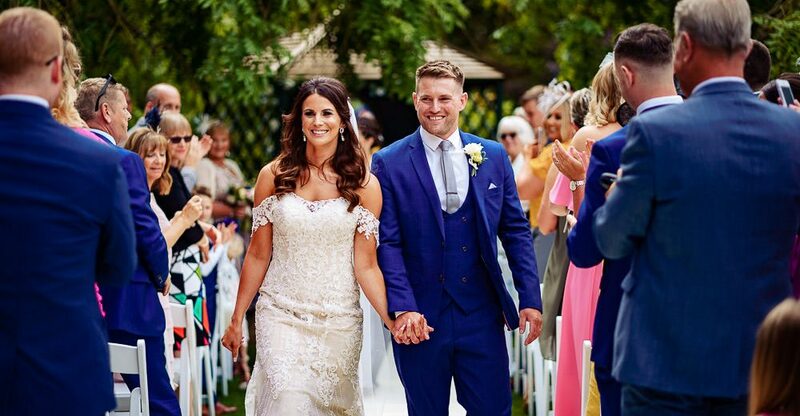 Once your marriage has taken place, we’ll remove the chairs so you can enjoy the gardens and terraces for your drinks, canapes and photographs. Our sound system can ensure your favourite wedding music is played or we can set up a space on the terraces for any musicians you’re hiring. Upgrade your wedding to include this premium garden ceremony set up for £500 on any date May to September. If the weather forecast is poor, we may move your ceremony indoors before it commences. As yours will be the only wedding of the day, you’ll have the beautiful Abraham Brigg Room or the Stuart Room on standby, just in case. Terms apply, please call us for details.